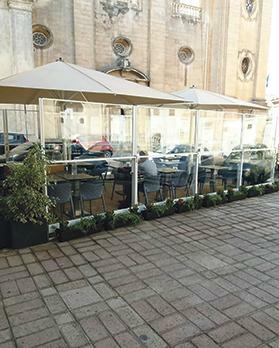 Naxxar residents and local council members are ‘livid’ that the Planning Authority accepted illegalities at a new restaurant on a public pavement in the old village. The regulator confirmed in September that Cicchetti, a restaurant on Victory Square, metres away from the parish church, failed to observe the conditions of the permit issued, adding it was monitoring the situation so the owners would regularise their position. All the irregularities originally confirmed by the PA were still in place. When, a few days ago, the Times of Malta asked for an update of the situation after receiving photographs from residents, the planning watchdog said all the irregularities had been settled following amendments to the permit. “Following a site inspection, the [Planning] Authority can confirm that the outdoor area for tables and chairs is according to approved minor amendments,” a spokesman said. A visit to the site showed that all the irregularities originally confirmed by the PA were still in place and that no changes had been made. However, it seems that through some new PA process, what had been defined as incorrect and not in conformity with the permit has been ‘straightened out’. After Times of Malta had reported on the situation, the restaurant operators had submitted amendments to the permit arguing that the modern aluminium structure they had erected illegally, instead of a low wrought iron structure to match the rustic ambiance of the area, as approved, was a better idea and should remain in place. Despite the objections of the Superintendence of Cultural Heritage, which insisted that the PA should not budge from its original stand, the planning regulator changed its opinion and told hotelier Michael Zammit Tabona, the restaurant operator, he could go ahead, sources said. Documents regarding the new amendments show that the PA completely ignored the Superintendence, which said that “the proposed aluminium-framed structure with retractable tempered glass panels does not add interest and variety to the townscape qualities of the area and the proposed material will detract from the vernacular character of the area impacting negatively on the cultural significance of the urban conservations area”. Times of Malta is now informed that a number of residents and the local council are considering taking legal action against the PA. The residents complained that, despite their objections and the conditions of the permit, Cicchetti continuously breached the rules by blocking the pavement, apart from noise and increased traffic generated by the commercial activity. They claimed that a similar structure was erected by Mr Zammit Tabona in front of the locality’s Labour Party club, which had also been converted into an outside catering venue by the same operator. Efforts to contact Mr Zammit Tabona proved unsuccessful by the time of writing.